Loving all your pumpkin topiaries. And, that buffet is gorgeous! What a great topiary and other finds but that chest you are waiting for Shirley, OUTSTANDING!!! I can’t wait to see it in your home. Shirley, I love your home!! Your porches are so gorgeous. I love everyone of your rooms. I love your style. Everything is just so pretty. Cute! 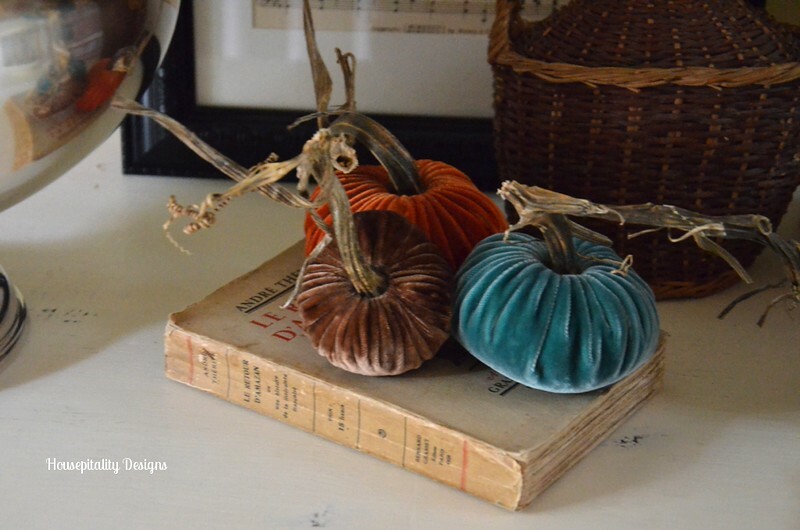 Oh how I love those velvet pumpkins!!! Spectacular in the silver bowl. I think this is my favorite topiary I have seen this fall. Have you pieces been shipped from France? Everything looks so beautiful! Oh nice! 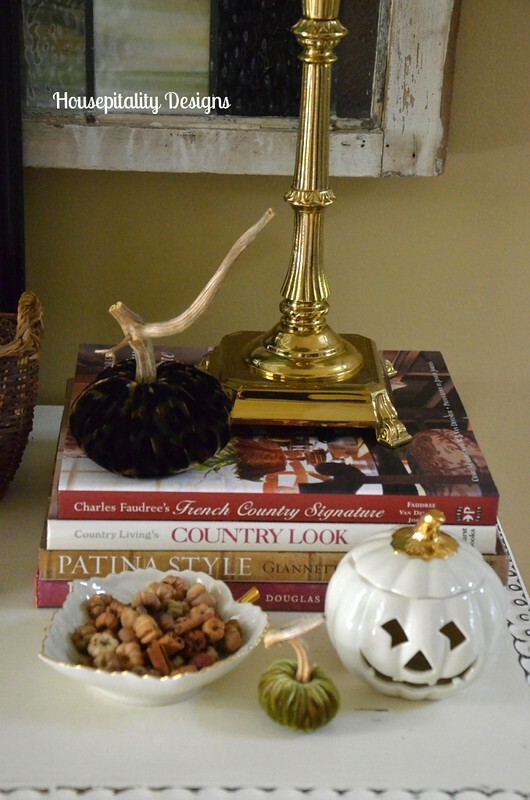 Love all the pumpkins and what a cool trophy dish ( it looks huge!) . That piece is fabulous! I bet you can’t wait for it to arrive. I like your framed ” Bless This House” too. Your whole vignette is so pretty, Shirley! I love the pumpkin topiary in the silver bucket. Such a nice contrast of textures. Love all the topiary’s – they are stunning. Your hutch is simply beautiful. Bet you can hardly wait for it to arrive from France. 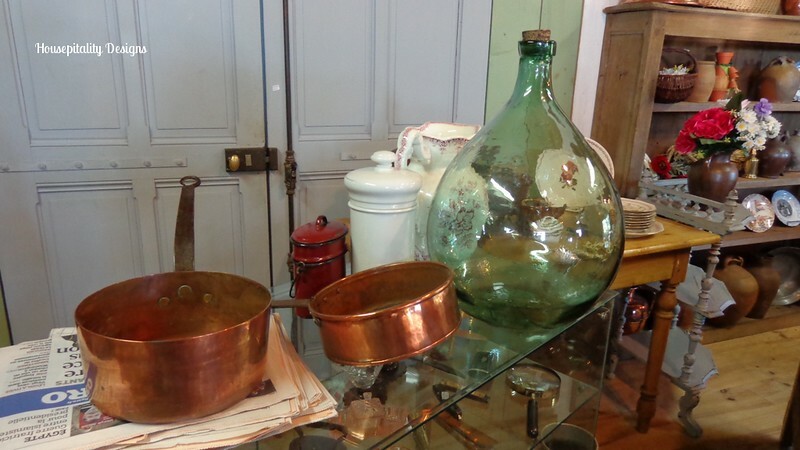 lauren @ the endearing home’s recent post…It’s My Blogiversary and a Great Big THANK YOU! 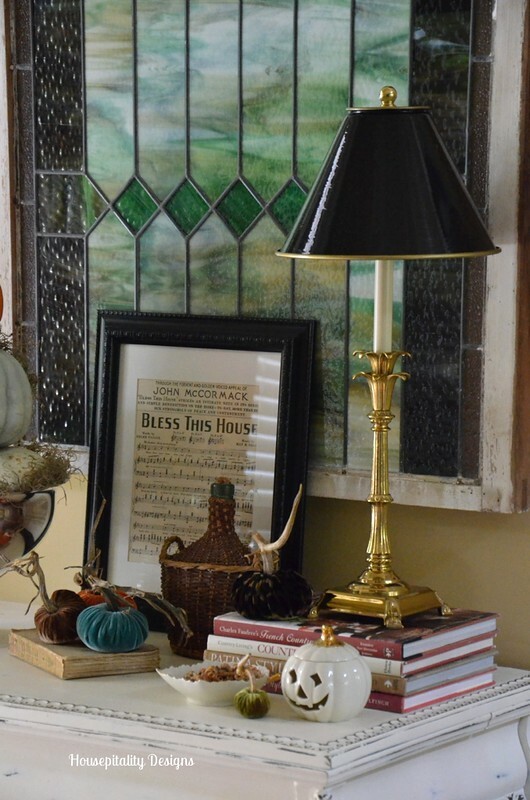 Such a festive vignette in front of your gorgeous window…so very pretty! Love your piece coming from France, she’s a beauty! 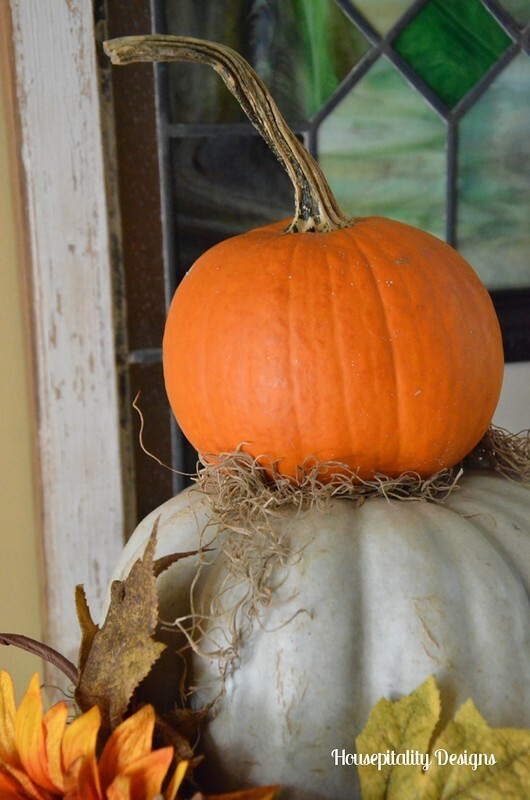 Your pumpkin topiary looks wonderful in the silver trophy bowl and your little Lenox jack o’lantern is very cute too! The new sideboard is gorgeous….I bet it is just killing you to wait for it to arrive. I can’t wait to see it in your foyer :o) Have a great weekend!!! Love the silver trophy bowl (and the pumpkin topiary). I can’t wait to see the buffet in its new home. Oh Shirley that buffet is gorgeous. Oh my that is so full of character and beautiful curves. She is just beautiful. Love your pumpkins in the trophy bowl. Very nice. Shirley I adore the pumpkin topiaries and the velvet ones are of course darling! I bet you are so excited to get your buffet! Shirley, your pumpkin topiaries are fabulous! 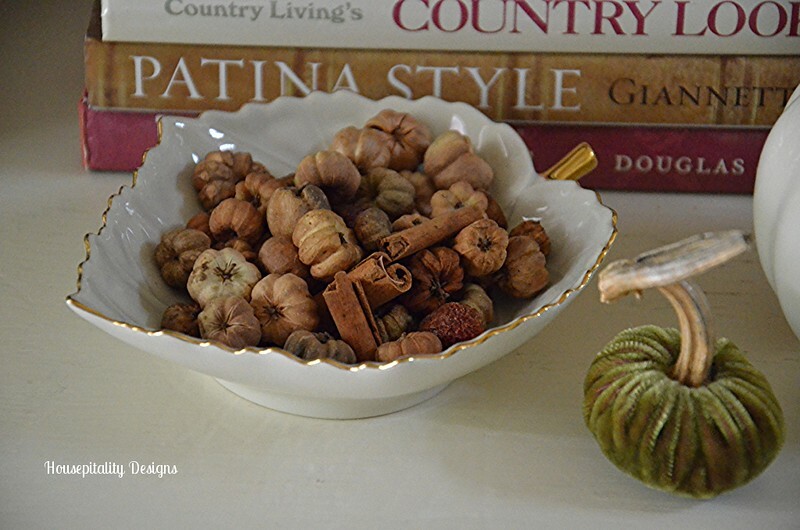 You always have such pretty vignettes! 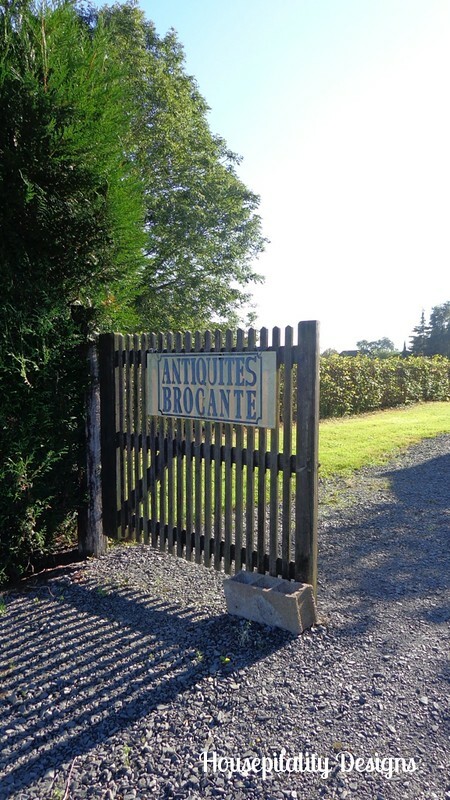 And my, oh, my…your treasure from France! What a beauty! I know you are going to have a blast decorating it! I didn’t even notice the A/C Return until you mentioned it!! I kept looking and looking.. it took me a while to notice it..LOL. But I do know how you feel.. we tend to notice things that others may not. 😉 Anywho… I love love love your topiary. It’s absolutely gorgeous, and how perfect are the pumpkins for stacking! You are the queen of vignettes… I’m always inspired by your vignettes… your sense of interior design in general is inspirational!! Stunning as always! Everything looks gorgeous ~ as usual! 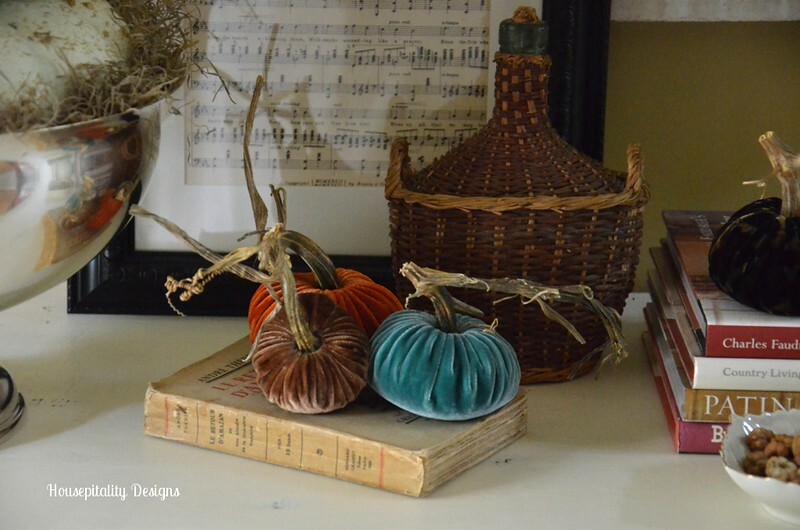 Love the topiaries and the velvet pumpkins. Can’t wait to see the buffet once it arrives. Wow! 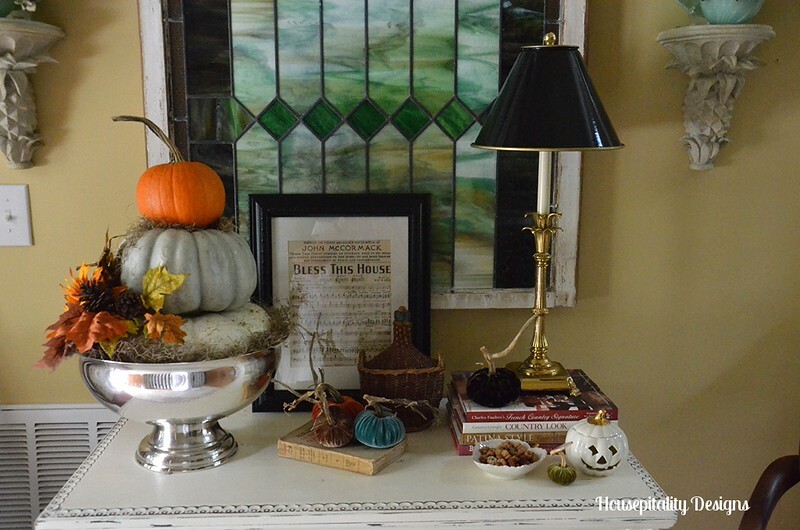 That silver bowl shined up beautifully…can’t believe that’s the same bowl that I saw and what I good idea to put the pumpkin topiary in it! You must be so anxious to get that buffet…it is incredible! 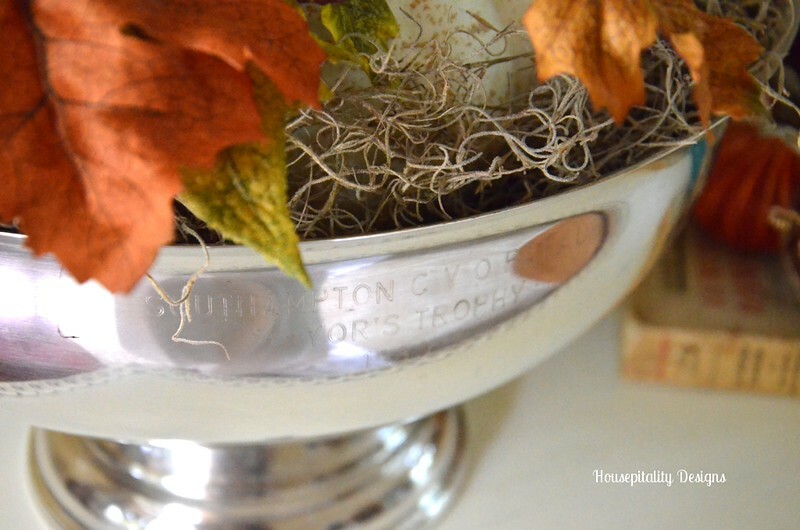 Shirley~ I love your pumpkin topiary in your silver trophy bowl! I’m sure you’re anxious your buffet to arrive~ what a beauty and handsome souvenir from your trip! You certainly hit the jackpot with that stunning buffet Shirley! It’s going to look perfect in your lovely home. 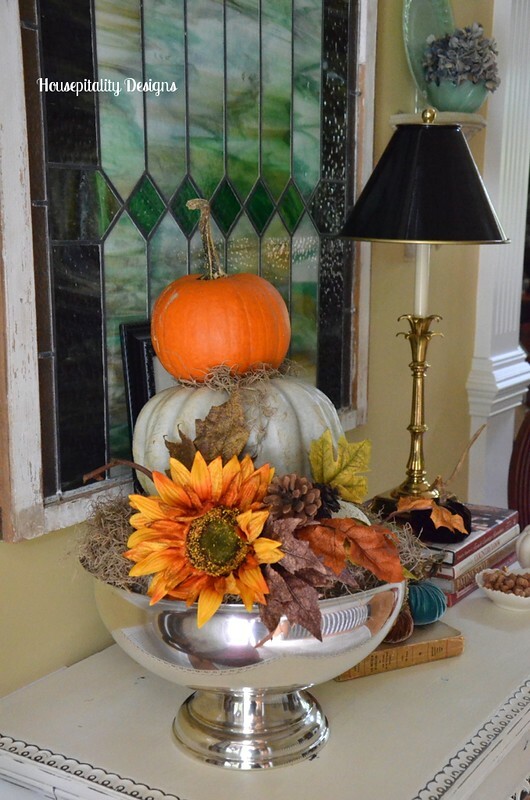 Pumpkin topiaries are so ingenious, and placing yours in a trophy bowl puts it over the top! And how lucky are you to have three porches?! Shirley, Your topiaries are beautiful and I think I like this one best. 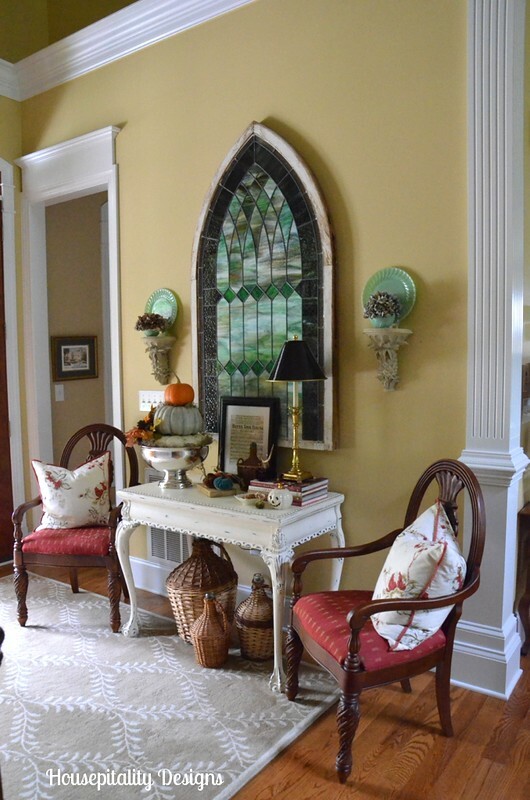 Love your foyer, It is so pretty. 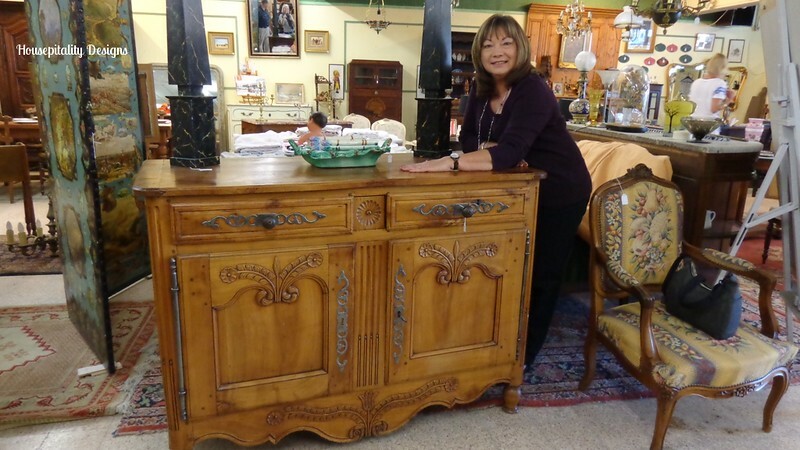 That French buffet is awesomely gorgeous, I know you can’t wait for it to arrive and would be tracking it every day. Great piece. However, don’t cover the return, it serves a very important purpose. Savannah Granny’s recent post…TRUE CONFESSIONS! Don’t you just love pumpkins, all kinds? One of these days I do want some of the velvet ones. Maybe I should try making them. The buffet is a beauty. 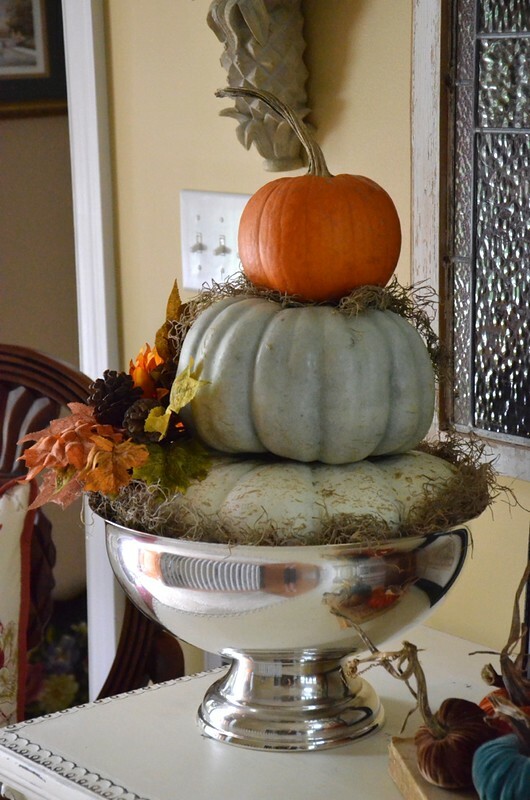 Your pumpkin topiary is so fun, and I love how you used the silver bowl as its base! I bet you just can’t wait for that gorgeous buffet to arrive…hopefully in time for the holidays?? Shirley, Your pumpkin topiary is gorgeous, and I LOVE, LOVE your silver trophy bowl. I’ll bet it looks fabulous with Christmas ornaments in it, too. I love your touches of fall. I am sure you are dying to get your new furniture from overseas. So exciting!! I love all your fall touches, but the pumpkin topiary is just gorgeous! 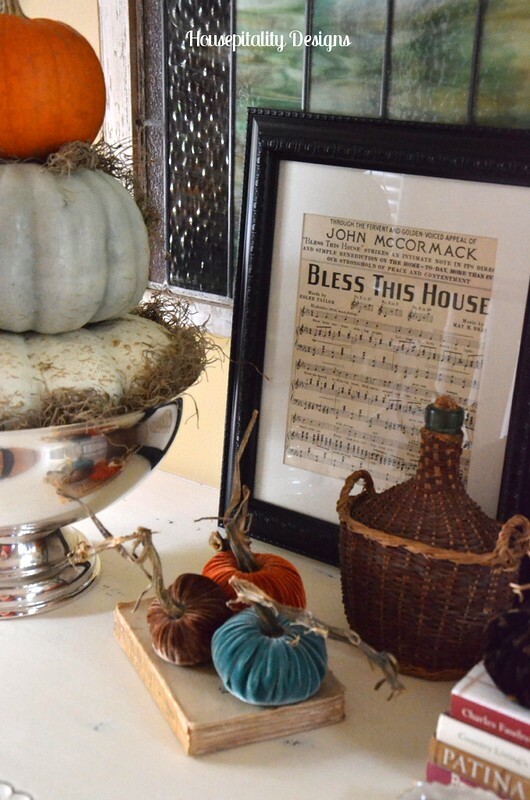 Your beautiful pumpkin topiary is perfect in the silver bowl, love your black lamp with it too! 🙂 Oh my goodness, if that buffet didn’t totally steal the show – it’s going to be amazing, you have to be beside yourself waiting!! love the buffet! 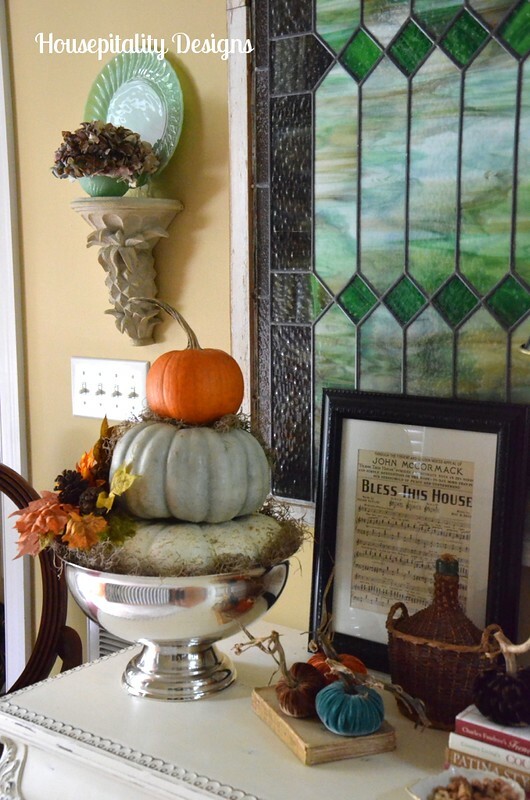 and that silver bowl is perfect for the pumpkin topiary!! Lovely topiary. It is so elegant and timeless. Love the framed sheet music too. Susan’s recent post…There’s The Rub! How did I miss this pist last year??? And you even mentioned me?? :):) I want to make pumpkin topiaries now too!! !